Skyzoo is a well-respected artist and writer in the music industry. 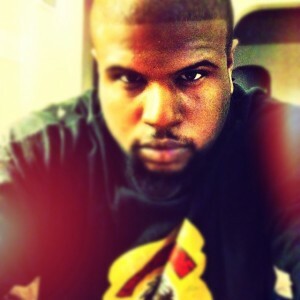 He has released several albums, EP’s, and mixtapes to the delight of music lovers everywhere. He has worked with some of the most talented artists in music including Jill Scott, Talib Kweli, Freeway, and Raheem DeVaughn. 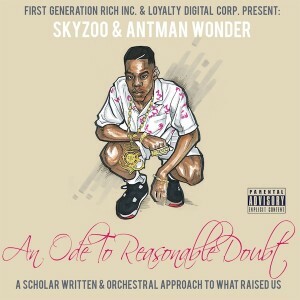 Now, Skyzoo has linked up with talented producer Antman Wonder to refurbish a classic hip-hop album. An Ode To Reasonable Doubt EP will be released on December 4th to pay homage to the legendary Brooklyn born rapper turned business mogul Shawn Corey Carter, better known to most as Jay Z.
Jay's Reasonable Doubt is considered one of the greatest rap albums of all time by many music connoisseurs. To re-create such a classic album is no easy task. However, The combination of Skyzoo’s lyrical skill and Antman Wonder’s innovative production style create a thought-provoking EP that I think people will be pleasantly surprised to hear. I had the chance to talk to Sky and Antman to discuss their latest project. Earmilk: How do you think growing up in Brooklyn shaped you as a person and an artist? Skyzoo: My approach to songwriting has always been based on my experiences, my background, my upbringing, they've always played apart in how I write and the stories I tell. So growing up in Brooklyn has had a direct on me as an artist. As far as me outside of the music, the way I view the world, the way I think, the way I handle situations, all stems from my surroundings from day one. E: You're releasing An Ode To Reasonable Doubt EP on Jay Z’s birthday December 4th, why this project? Why now? S: The idea came from the fans honestly. I received a tweet from a fan back in 2011 after Elzhi released his Illmatic remake "Elmatic", asking if I'd ever thought of doing the same with Reasonable Doubt. I retweeted it and jokingly said "who knows, that'd be crazy" or something of the sort, and I began getting endless replies to and RT's of that one tweet. I left the idea alone, but still got asked literally daily if I'd do it. So I finally put some time aside and said ok. It was strictly to give the people what they've literally been asking. If it weren't for that original tweet, this project wouldn't be happening. Time wise it just made sense to release it on Jay's birthday, from a "salute" standpoint and a marketing standpoint. E: What was your thought process when remaking the beats on Reasonable Doubt? Why this album? Antman Wonder: It started out with just reimagining "Bring it On" because Dj Premier never released the sample information for it. I have this thing where if I like something enough, I'll pick it apart by recreating it. My homie Ivan Rivera (of Justice League) heard it and said I should do the whole album. I started to, but then my plate got full. Skyzoo heard some of it and pulled me right back in. E: Is there a track on your latest EP that you are most fond of? Why? S: My favorites are all 9 of them, lol. But if I had to choose id say "The Truth About Regrets" and "Conversing on Coming Up", because they're based on my 2 favorite Reasonable Doubt songs, "Regrets" and "Coming of Age", respectfully. E: Describe how it is working with Skyzoo in the studio? AW: We've been communicating through emails, texts and phone calls. We won't actually go into the studio until it's time to finalize the project. We still bounce ideas around though. E: Describe your style as a music producer? AW: I don't have one particular style, but what I'm becoming known for is my organic sound and vintage nuances. I try to stay evolving and trying new things. E: Are there any collaborations on your latest EP? S: There are collabos, based on the original RS project. Where Jay had Mary J Blige, I used Mela Machinko on that spot. Where Jay had Sauce Money and Jaz-O, I brought in Torae and Sha Stimuli. Where Jay enlisted Mecca, I called up Kay Cola, and where Jay introduced Bleek, I'm introducing Diizco. E: What are your thoughts on how hip-hop music has changed from the 1990's until now? S: The change has been pretty drastic, for better and for worse. The technology has been a double edged sword, but I like to think it's done for good than bad. On the flip side though, it's become apart of how people think when they create. It alters and sometimes hinders how people create music, based on what they think can come from it on the digital side, the new era, etc. Hip Hop specifically took a hit because it seemed to the outside looking in that it's an easy artform to get involved with and create/profit from. We've had to deal with that but we've also experienced some incredible achievements that no one thought we would acquire. Heights no one saw us reaching, so I guess it comes with the territory. E: How do you think you’ve evolved as a lyrist over your career? S: My goal is to always grow, climb the ladder, no matter how dope I may currently be. I grew up watching Michael Jordan win consecutive rings and realized that once the celebration calmed down, he probably went right back to the gym and shot 1,000 jumpers daily over the summer. So that's what I do. Shoot 1,000 jumpers a day. I always push for me as far as the pen goes. E: Who are some of your biggest musical influences? S: Obviously Jay, as well as Nas, BIG who I have the pleasure of saying a grew up a block away from, Mos Def, Andre 3000, Miles Davis, Wayne Shorter, Ahmad Jamal, John Coltrane, etc. They've all helped shaped me and my approach to music. E: Are there any music producers that you look up to? Why? AW: I look up to composers mostly such as; David Axelrod, Quincy Jones, Stevie Wonder (name inspiration), Isaac Hayes, Larry Dunn, Willie Hutch, Norman Connors. As far as hip hop goes, its Dj Premier, Pete Rock, Marly Marl, Ski, Dr. Dre, Just Blaze, Bink, Pharrell, Timbaland, … The list goes on. But they were all apart of what shaped my sonic scope of music. E: What are your top 5 favorite albums, by any artists, of all time? Why? S: Jay-Z's Reasonable Doubt, Nas' Illmatic, Miles Davis' Kind of Blue, John Coltrane's A Love Supreme, and there so many others tied for that 5th spot that id have to leave it open. The reason for all of the above is the same; the stories. The storytelling, both lyrically and sonically, is what drives me to vouch for them and hold them so near and dear. E: Where do you see yourself five years from now? S: Five years from now I see me continuing to use my writing in various mediums, all while telling my stories. Whether it's music, film, TV, literature, whatever comes my way, as long as I can be creative and tell stories and live comfortably from them, influence others, make history, and go to Knicks games, I'm cool. E: What other artists have you worked with? AW: I've worked on projects for many artists, but personally working WITH artists, theres only been a few. I've worked mostly with Add-2 out of Chicago who just signed with 9th wonder's Jamla, My homie Dominique Larue out of Ohio, Chill Moody from here in Philadelphia, and Peedi Crack, amongst others. E: Is there anything you would like Jay Z and your fans to know about An Ode To Reasonable Doubt EP before they listen to it? S: I'd want Jay to know that this was done out of requests from the people, and that it's a remake honoring the music that raised us. The intentions were to show love, salute, and hopefully introduce a younger crowd to what they may not have been here to experience. And I'd want the fans to know that these stories were rewritten from my personal point of view. The goal wasn't to pretend to be Jay, but rather to continue to be me, while hypothetically placed in similar scenarios. Be on the look out for An Ode To Reasonable Doubt EP out on December 4th!